"Wilson Ramos #40 of the Washington Nationals tags out Buster Posey #28 of the San Francisco Giants at home plate after Pablo Sandoval #48 of the San Francisco Giants hit a double to left field in the ninth inning during Game Two of the National League Division Series at Nationals Park on October 4, 2014 in Washington, DC." Spontaneity is a wonderful thing and going into anything with an open mind not knowing what to expect is the best way to approach life. During Game Two of the National League Division Series a stellar game of pitching brought fans to their feet as a play at home just about decided the game in the ninth inning. 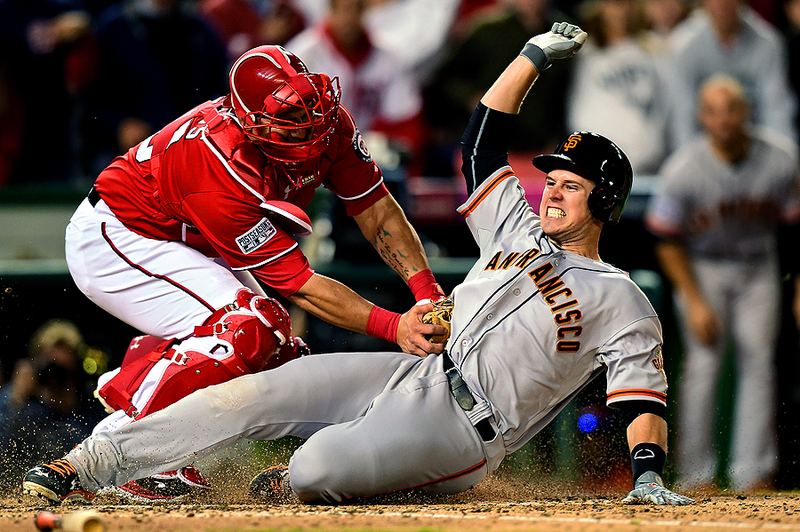 With the game tied at one a piece, Buster Posey of the San Francisco Giants made a run to home plate, yet was tagged out. An extra inning win was sure to bring this game to a close following the dramatic play at the plate. However, in incredible fashion, the game went into a post season record of 18 innings and the entire game clocked in at about six and a half hours. Had Posey scored in the ninth, the game most likely would have ended, but fans and all in attendance got two games for the price of one.